The gazebo area is set up with wood and bamboo. The First Ferry recreated for a Chinese family resident in Dubai a home away from home that both represents their cultural roots and Middle Eastern elements. Designing homes that reflect the owner’s personality has been a forte of The First Ferry and at one of its latest commissions in Dubai’s The Springs, the award-winning design firm has aimed to do just that while creating its own Chinese ‘Garden of Eden’ in the UAE emirate. 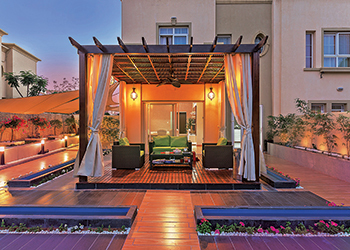 “The client and his family – hailing from China and living in Dubai – wished to recreate a home away from home – a paradise filled with intricate elements that define their cultural roots, yet wrapped in the grandeur of the Middle East,” says Prateek Chaudhry, skipper and managing director of The First Ferry. “From the onset, it was about creating relationships and working as a team and ensuring that we relate with the client. We had to become friends, and then dig into their childhood moments, romance, failures, fears and achievements. Parquet flooring enhances the interiors. The design is representative of the client and his family’s tastes and aspirations. The space exudes an elegant simplicity, assimilated with clean white lines and the use of sustainable materials. Certain sections like the master bedroom are hand-painted in order to reinforce the principal philosophy, according to Chaudhry. Describing the key design features of the project, he says: “The living room has an aura of peace and purity. The white contemporary furniture occupies the key space. 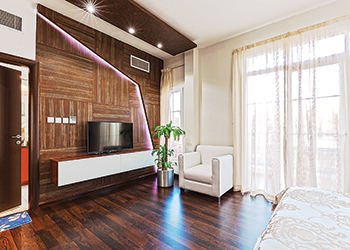 The use of wood for flooring, TV installation and part of the faux ceiling are a few key elements that blend into the minimalistic design and a sense of earthiness. “The master bedroom is a display of The First Ferry’s passion for the arts with two walls hand-painted to create an artistic repose. The other bedrooms are energised with unique lighting installations and intricately designed floral wallpapers, bedsheets and covers. The wall with the TV installation ... hand-painted to create a wooden pattern. White is the principal colour for the space, complemented with shades of brown and grey which are complemented through the use of different materials. These include wood and gravel-textured finishes on walls. The spaces that stand out are the colourful gazebo area, accentuated with flowering plants and pools; and the toddler’s room with colours that pop – visible in the bright yellows and whites. The space has a soft matte finish to maintain its graceful style. 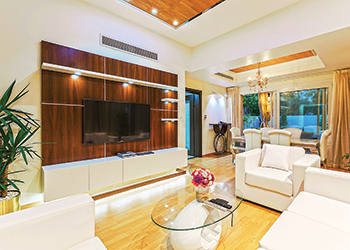 Wood is the primary component along with metal and mirrors used in different spaces to set specific moods. The gazebo area is set up with wood and bamboo. Parquet flooring contributes to the interiors as well as exteriors and landscaping. The dining table set and the living room furniture are crafted with a metal skeleton and cushions produced at The First Ferry’s joinery. These furniture and fittings were then transported from the joinery to the site for setting up. “This enabled a stricter regulation of quality and a flexibility in providing custom-built furniture of the highest quality to suit the project,” Chaudhry concludes.